Andrea Dovizioso bested the treacherous conditions to take a brilliant victory at the Valencia Grand Prix. Dovizioso (Ducati) secured his third win of the season in commanding fashion. Avoiding contact at both race starts, the Italian settled into a metronomic rhythm, closing in the race leader, and passing effortlessly. 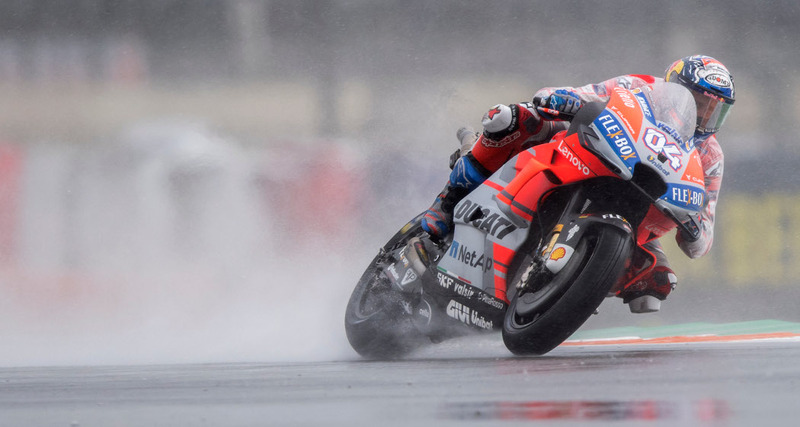 As conditions worsened the Desmosedici GP18 remarkably began to perform better, the back tyre acting almost as a rudder helping its rider to square-off every corner and avoiding those treacherous painted lines and kerbs. Not once did Dovizioso put a wheel out of line, or even suffer a wobble. A true masterclass in wet weather conditions. The result sees Ducati break their 10-year hoodoo at the Ricardo Tormo, following Casey Stoner’s victory for the team here in 2008. Alex Rins (Team Suzuki Ecstar) had a near perfect weekend, surfing the rivers across the circuit to a brilliant second place. It was his fifth podium finish this season, and without doubt his finest to date. There will be a small air of disappointment as Rins had led for much of the curtailed race, and for the opening few laps following the restart. Once again, the fault – if any – lies in the lack of horsepower to the Ducati. Rins simply stood no chance on the main straight. If the team can coax enough power out of the engine to be competitive in a straight line, that first breakthrough win for Rins will become a certainty in 2019. 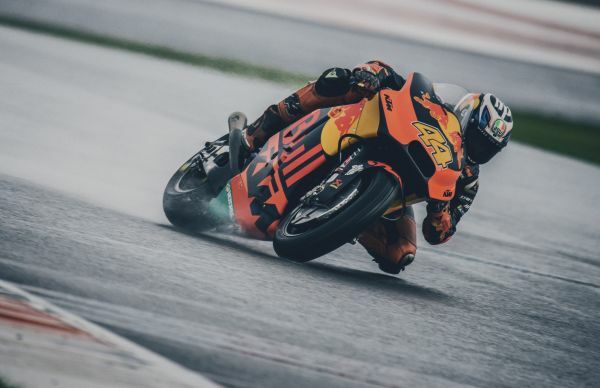 Pol Espargaro claimed his first podium finish for the Red Bull KTM team in the premier class. It was also the Spaniard’s first rostrum finish since moving up from Moto2 in 2014. Having had to fight his way through the field twice (courtesy of the red flag delay) the 27-year old produced without doubt his finest performance to date, carving his way ahead of his rivals with what looked like astonishing ease. The result will send a wave of confidence through the team as they head into winter testing on Tuesday. Michele Pirro (Ducati) wildcarding this weekend, led the charge for best of the rest in 4th place. The Italian led home the retiring Dani Pedrosa (Repsol Honda). It was fitting that Pedrosa (P5) finished the lead Honda rider home. There were emotional scenes upon his return to the team box after the race. Takaaki Nakagami (LCR Honda) claimed the best independent rider award with his 6th place finish. The young Japanese rider has steadily improved throughout his rookie season in the premier class, and brought home his best result to date in extremely testing conditions. A successful first season, and both team and rider will look to build on this over the winter. Johann Zarco (Monster Tech3 Yamaha) and Bradley Smith (Red Bull KTM) spent the entirety of the restarted race locked together in a thrilling battle for seventh place. The Frenchman eventually emerging victorious and securing for himself the top spot in the independent riders’ championship. For Smith, it was a solid result as the British rider bids farewell for now to racing full time in the premier class. In 2019 he moves to the Aprilia Gresini team to take up duties as test rider – though he will still wildcard in up to five rounds next season. 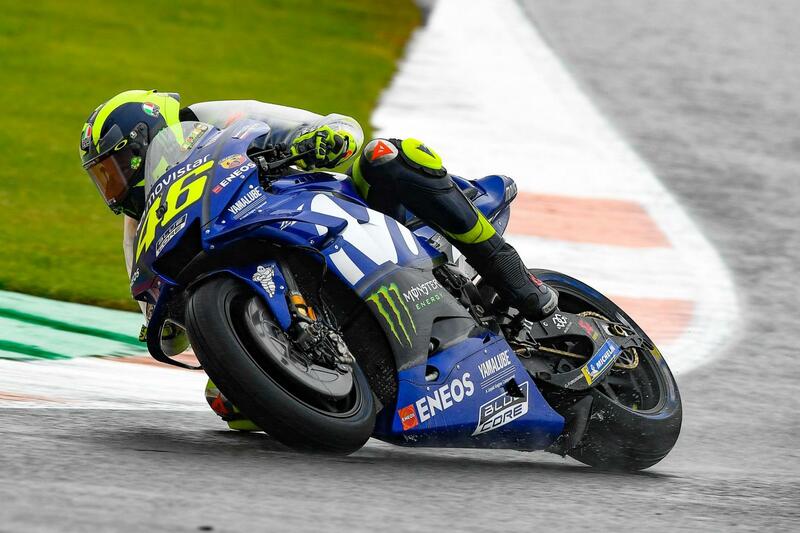 It was a case of so near again for Valentino Rossi (Movistar Yamaha). Having produced a fine performance prior to the red flag delay – having originally started P16 on the grid – the former world champion looked set to finish on the podium, and once again spare Yamaha’s blushes. However, with just a handful of laps remaining, his bike lost all grip at turn 12, spinning him off into the sodden gravel trap. The Italian remounted and eventually finished in P13. It was also a disappointing finish to Alvaro Bautista’s MotoGP career. The Angel Nieto Team rider, moving to spearhead Ducati’s factory effort in World Superbikes from 2019, crashed out with 6 laps remaining of the race. Scott Redding (Aprilia Gresini) narrowly missed out on a top ten finish, finishing just behind Stefan Bradl (LCR Honda) and Hafiz Syahrin (Monster Tech3 Yamaha) respectively. A solid result and relief that his annus horribilis is finally at an end. The 25-year old now bids farewell to MotoGP and begins life in the British Superbike Championship, on very competitive Ducati machinery for next year. There was an extremely high attrition rate, due to the deteriorating track conditions. Amongst the fallers there were spectacular highside crashes for both Marc Marquez (Repsol Honda) and Andrea Iannone (Team Suzuki Ecstar). Maverick Vinales (Movistar Yamaha) also endured a miserable race, despite starting originally from pole position. His season ending in a brutal crash with 15 laps remaining. None of the three were able to race at the restart, but all fortunately escaped injury.